Gallery Cosmos holds a group show of diverse works by photography lovers. Once a year, the forty-four members of НИТЬ, a group of photography lovers that takes its name from the Russian word for thread, gather together to hold a group exhibition. Each year, each photographer creates a new series around an individual theme, displaying one of their favorite works in large format and creating an original book with the rest of their photographs. The work varies. Some seem as though they were taken straight out of the Getty Image files, some are candid snapshots, some portray natural scenes or still lives. But the large-format photographs that stand out are those with a quirky voice or a striking composition like the works of Wako Uzuki, Takeshi, Wakako, Maki Sogabe and Mitsuru Nishimura. Visitors are provided with gloves to flip through the books. The choice of binding, cover, size, and shape are expressive of each artist. One sports a green textured rice paper cover, a few look like coffee table books, while another, bearing the enticing title “secrets,” looks like the door to a dollhouse. Wakako’s book Ladakh, Little Tibet in Northern India is bound in a sleek black cover. Hers is a stunning collection that shows diversity in her choices of camera, composition and content. 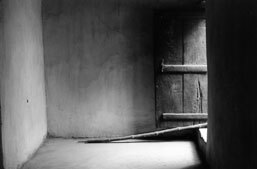 In the first photo, a heavy door has been swung open and a bamboo stalk leans into a clean swept room. After that come image after image that dwell on moments of stillness. Seen through a pinhole camera, bundles of colorful flags wrap around a lamppost. 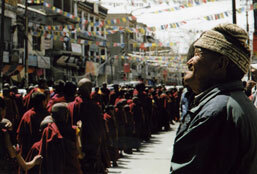 An old man squints into the sun as a parade of young monks tromps by. Grey ashes sit in a grey bowl on a grey slab of weathered wood. A boy reads cross-legged while nibbling doggedly on a pen. Wakako’s works are solid documentations of place. They are solitary and object-driven, simply composed and filled with longing. Wako Uzuki offers Tarinai Tamentai, wry and seemingly unrelated sets of three square photos per page that seem to be punchlines to a private joke. Although oddly matched, these sets of three make for satisfying visual associations: a dead black crow sprawled on a sharp curb; a man facing a broken window, his hood covering his face; and a red bottle of detergent with bubbles bursting out of the top. The images are urban, candid and intimate—a waist with low slung jeans, schoolgirls in a drained pool, band-aid wrappers on an unmade bed. Takeshi’s strongest piece is a tight focus through a window mosquito screen: the hatches of the screen change color and in one corner a tear in the wire reveals a cityscape, silhouetted by the setting sun. Mitsuru Nishimura’s black-and-white portrait draws out a singular moment from a mundane topic — a young child with its head buried in a white comforter. Maki Sogabe’s Tokyo Tower is whimsical and nostalgic. Her book is made up of color photocopies of her polariods stuck to paper with multicolored tabs of tape. Pages in her book are a journey through memory: beach days, the old Tokyo, and stilted family portraits. Though she uses only polaroids, Sogabe’s work is compositionally interesting, evocative and nostalgic. Even paper Dixie cups with toothbrushes sticking out of each one are well-composed and stand up to enlargement. Making sense of forty-four photographers with one book each is a daunting task, but НИТЬ offers viewers a chance to choose a favorite photograph and explore the world each photographer has created.